Well our poll about who should be the new Borg CEO has closed and much to our surprise King of All Bloggers Robert Scoble has emerged as the people’s favorite to replace Steve Ballmer. Scoble got 786 votes, or 39% of the total, compared to 534 for Gates and 507 for Ozzie. Much love to all who participated. 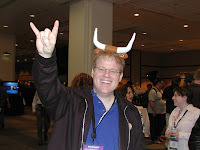 And congratulations, Robert Scoble.